And here are some of my other favorite ads from ESPN featuring Darth Vader, European soccer fans, and second string mashed potatoes. Also I'm assuming Raffa isn't feeding the SportsCenter ladies these. It would be the largest deal in baseball history. Cano is a really good player, but he shouldn't be that guy. Dustin Pedroia just took 8 years for $110 million, and it's obnoxious of Cano to think he's worth more than double what Pedroia is. Currently the most expensive contract ever is Alex Rodriguez's 10 years at $275 million, of which he still has four more years left to go. The Yankees were hoping he'd get a lifetime ban for steroids to help get them out of that one. If that's not bad enough, look at the ten year deal Albert Pujols just signed, of which he still has 8 more to go at roughly $24 mil per year. The 32 year old Pujols hit .258 with 17 home runs and 64 RBI's this season; have fun paying him when he's 40 Anaheim. Cano is 30, and a 10 year deal would probably land whoever signed him in the same boat as the Yankees with ARod and the Angels with Pujols, and that is not a boat anyone should ever want to be in again. Why ask for three hundred and five million? Seriously? That extra 5 just makes it all the more asinine. This post fits into the category of "my bar/restaurant pet peeves." Some of it's predecessors include etiquette for tipping on "to go"orders, the concept of "buying rounds" (and how to do it), what should go in a snifter, what to do if your server isn't standing right in front of you the instant you want something, and the myth of "skinny girl" drinks. I realize I probably sound like a whiny bartender, and this one may be the worst of all, but it's something that irks me so I am going to write about it. We have over 100 tequilas at the restaurant I work at, and all of them are good. If you walk in and order a margarita with Jose Cuervo, you're actually getting a worse drink than what I would have made you anyway. Cuervo Gold used to be an up-sell/premium tequila back before good tequilas became prominent. But now that they are, Cuervo is garbage by comparison. Now I'm using this tequila analogy to set up my main point: When you're in a high-end tequila bar, asking if I can make a jalapeno margarita is kind of like asking for a Cuervo Gold margarita. Jalapenos were the first chili pepper to gain mainstream popularity, but now there are tons of other good ones that are readily available; pasilla, poblano, chipotle, morita, serrano, habanero, etc, just to name a few. 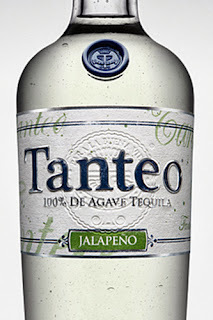 I've been making spicy margaritas since 2005, and I've never used jalapenos, they're old and boring. So if spicy tequila is your thing (and it should be, it's totally awesome), I highly recommend not buying something like what's pictured above. Instead go to the store, pick out a pepper (most of them cost around twelve cents, literally), chop it up, and throw it in the bottle of whatever tequila you choose (preferably not Jose Cuervo Gold). 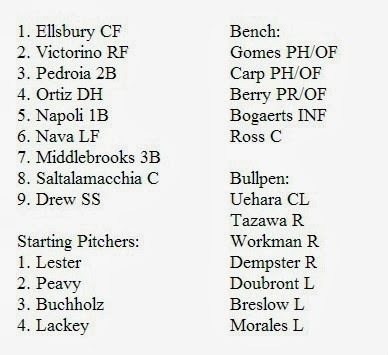 I love that Boston has two quality pinch hitters in Gomes and Carp, as well as Quintin Berry (who's never been caught stealing in his career, 22 for 22) to play the Dave Roberts role. Determining the starting rotation is tough, but that's a great problem to have. Lester and Peavy get the nod from past big game experience, pushing Buchholz back to 3rd primarily because he's only thrown 17 innings since early June. It should give the Sox a nice mismatch against the opposing team's #3 starter as well. The bullpen looks a little shaky; I'd like to see both Dempster and Doubront given lot of relief work over the final three games in Baltimore in order to get them adjusted to their new roles. I wouldn't be surprised if Workman, Breslow, or Morales lost their spot to utility infielder John McDonald. There's no real backup for Pedroia, and a defensive replacement infielder/2nd pinch runner/one more bat is probably more likely to be needed than a 12th pitcher. I wonder how the Nationals feel today about their Stephen Strasburg decision last year? The Pittsburgh Pirates locked up a Wild Card spot last night, ending a 20 year postseason drought (the 3rd longest in MLB history). With the Reds also clinching as well (both teams could still overtake St. Louis for the NL Central crown), the Nationals were officially eliminated from playoff contention. 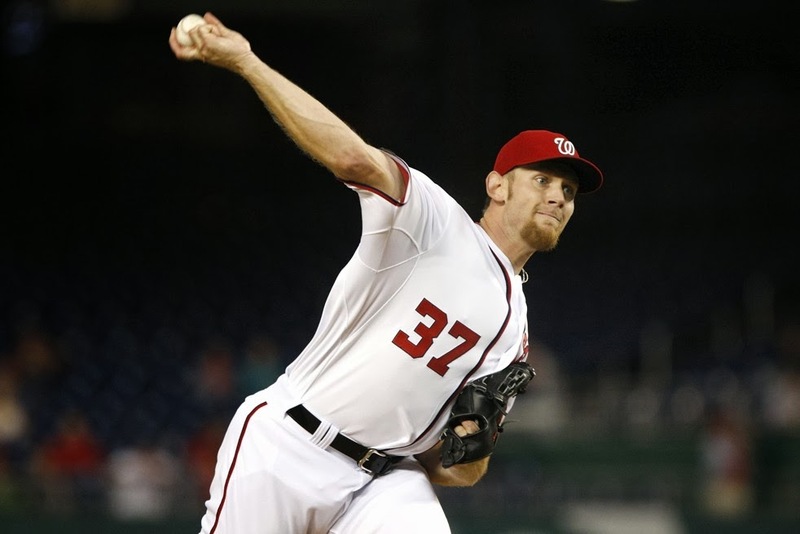 But, at least Washington still has a healthy Stephen Strasburg to make his final start of the year against the Diamondbacks on Friday. Unfortunately for them it's going to be totally meaningless. So far that's the reward they get for shutting Strasburg down in September of last year in order to save him for the future. They were 85-53 at the time, with the best record in baseball. The Nationals ended up losing their opening playoff series without their ace, and who knows when or if they'll ever another such opportunity to win it all. And guess what else is funny? Last season Strasburg made 28 starts before the team elected to voluntarily stop using him in order to preserve his health. This year injuries have held him to just 29. 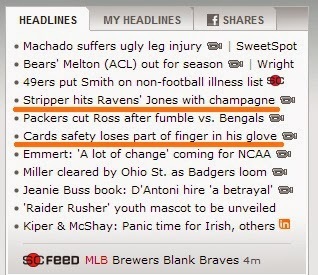 To the right are the top sports headlines from ESPN.com earlier today. There's often a weird one in the bunch from time to time, but it's pretty rare to get two so unusual. Now to clarify, it was a champagne bottle that the Baltimore Ravens Jacoby Jones was hit over the head with. Unfortunately what he did exactly to incite the wrath of a stripper on the party bus he was riding late Sunday night/early Monday morning is not included in the story. As far as Arizona Cardinals Rashad Johnson's missing fingertip is concerned, it's not actually lost at all; the team's training staff found it (with the nail still intact) in the glove they removed from his hand. Johnson is not sure how the injury occurred, he just knows his hand went numb and started bleeding profusely after making a tackle. Last night Johnson underwent surgery in which the bone in his middle finger was shaved down, and the remaining skin was stitched shut around it. According to the report "there were no plans to reattach the finger." First off it kind of blows my mind that it's been 17 years since the murder of Tupac Shakur. Now here's what's weird: As I was wikipedia-ing Tupac for some background info I just saw that the drive-by shooting that led to his death occurred on September 7th, 1996 (he died six days later). The first and only other time I've ever mentioned him on this blog was two weeks ago, on September 8th. "Changes" wasn't released until 1998, but it's actually much older than that. Tupac recorded it in 1992, and it also recycles Bruce Hornsby's 1986 hit "The Way It Is." 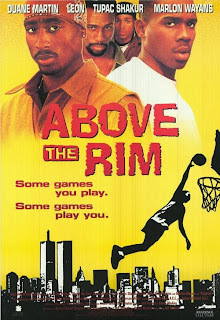 And I realize this song came out a few years after the movie Above the Rim, but I had to use that pic anyway. It's the first thing I think of if you mention his name, and was easily one of the coolest movies out there my senior in high school. I totally wanted to play against Birdie's basketball team.